Molded in Hobby Boss' typical light grey plastic, the kit is packaged with one sprue per poly bag. The exceptions to this are the upper and lower hull which are in one bag and the four rubber tires which are in another. 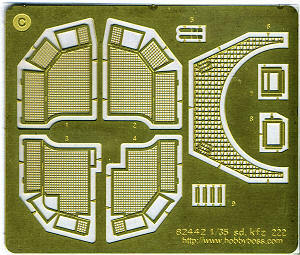 The kit's three photo etch sprues are packaged with a section of thick card to keep them unbent. The detailing on the parts is first rate. There is no flash, I found no sink marks and while many parts have ejector pin marks on them, assembly will determine how many, if any will be visible in the finished product. The kit includes a full chassis complete with frame rails, cross members, differentials and suspension parts. There is also a complete transaxle assembly and what appears to be a full motor as well. Unlike many other 222 kits, this one comes with a full interior as well, complete with weapons stowage. 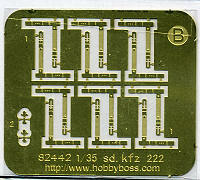 The photo etch is an integral part of the building of this kit so one cannot really leave any of it off. Of course, much of the p.e. is used for the anti-grenade screens, but there are a myriad of other places where it is used, both inside and outside the vehicle. One of the highlights of the build is the 20mm cannon and its mount. 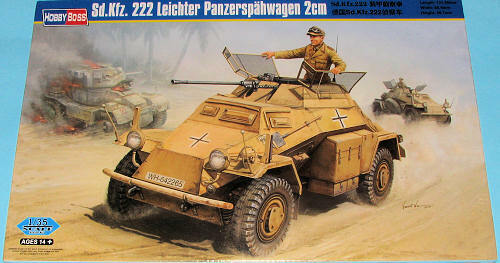 The detailing is superb and one has the option for three different guns; a Flak 38, KWK 30 and KWK 38. Even the rubber tire s are superbly done and add a bit more realism to the finished kit. Instructions are on two large fold-out pages that include painting information during the build in generic and Gunze colors. The overall painting guide is full color and offers more paint choices. 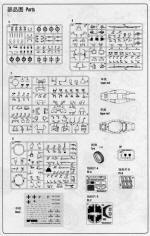 You basically have a choice between panzer grey and desert tan vehicles that differ only in license plates and unit badges. Both are with North African units. 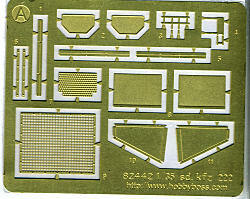 The decal sheet is well printed and provides basic insignia and license numbers.